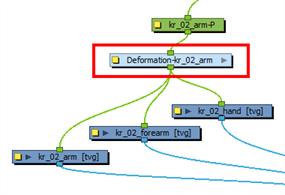 When creating a deformation rig, you may want to copy and paste the deformation group created for a drawing and connect it to another drawing. 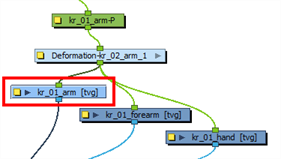 For example, after creating a bone or curve chain for the arm of a character, you may want to copy and paste the deformation group to use it on the other arm. The problem with copying and pasting deformation groups is that the Transformation switch in the group will still point to the first drawing it was connected to. You can easily correct this problem by using the Associate Parent Transformation Switch with Selected Element button. In the Node view, copy the deformation group node. Paste the deformation group node. Connect the second set of drawings to the deformation group node. If these drawings are attached to a peg, be sure to put the deformation group between the drawings and the peg. Enter the Deformation group by clicking on its grey arrow. 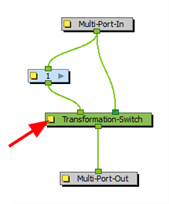 Open the Transformation Switch properties by clicking on the yellow box. Notice that the drawing that the Transformation Switch points to is the original drawing that it was connected to. Exit the deformation group to return to the main Node view. 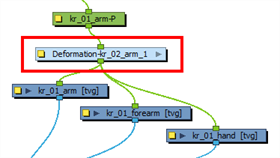 Select the drawing node connected to the copied deformation group. If there are multiple drawing nodes connected to the same deformation group, select the drawing at the top of the hierarchy or the one that makes the most sense for your setup. From the Deformation toolbar, click on the Associate Parent Transformation Switch to Selected Element button. If you do not see this button in the Deformation toolbar, you need to add it—see Deformation Toolbar. The Transformation Switch now points to the correct drawing. Rename the deformation group to match its associated drawings.